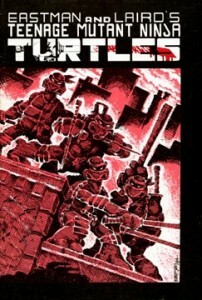 The book opens with the TMNT battling some 15 gun-toting thugs and mopping up the New York City alleyway with them. 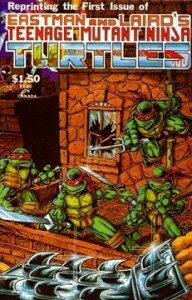 Once the police show up, the Turtles head for home in the sewer. The TMNT find Master Splinter and tell him of their victory. Splinter decrees that they are now ready to be told of their mission… a mission of retribution! The Sensei tells the Turtles, for the first time, their origins. Splinter was once the pet rat of Hamato Yoshi, said to be the greatest shadow warrior of his clan, known as the Foot. While watching Yoshi practice his art of combat, Splinter would mimic his movements and eventually became as adept as his human benefactor. Splinter explains that Yoshi had a bitter rivalry with a fellow clan member, Oroku Nagi. They competed fiercely in all things, even in matters of the heart. They both fell in love with a beautiful girl named Tang Shen, but she loved only one of them in return: Splinter’s Master, Yoshi. Nagi became extremely jealous and one night in a fit of rage he went to Tang Shen’s home and demanded that she love only him. She refused, and Nagi began to beat her. Just then, Yoshi came upon them, and in a fit of red rage he slew Nagi. This was a shameful act in the eyes of the Foot Clan, as one member must never kill another. Yoshi had two choices: he could take his own life in ritual suicide and hope for honor in the next life, or he could flee the Clan and attempt to start a new life. Master Yoshi decided on the latter, and fled to New York City with Tang Shen, Splinter, and a few possessions. He started his own martial arts school and all went well for years. In Japan, Nagi’s brother Saki had sworn vengeance against Yoshi, the man who had killed his sibling. His anger pushed him to become a premiere ninja in the Foot, and as a reward for his hard work and diligence, the Clan sent him to New York City to lead the Big Apple’s branch of ninjas. Saki recognized this as his opportunity to reap his revenge against Hamato Yoshi and slay him. Saki quickly built the New York branch of the Foot into a criminal powerhouse involved in many illegal activities; from drug smuggling and arms running to their specialty of assassination. But he never forgot his goal, and after a time he tracked Yoshi and Tang down, and set his vengeance into motion. While Yoshi was away at work, Saki broke into his apartment and murdered Tang Shen. Saki lay in wait until Yoshi returned home. As Hamato walked through the door he saw his dead wife and her murderer Oroku Saki, who proclaimed himself to be the Shredder. A great fight broke out, and Splinter’s cage was broken, freeing him. Eventually, the youthful Shredder bettered his older combatant, and Yoshi was slain as well. Anguished over the death of his Master, Splinter fled to the alleys and lived off of garbage scraps. Until the day when a TCRI truck drove by, and a strange canister flew out of its hold. The container struck a young man in the head, bounced off of the pavement and smashed into a boy’s aquarium filled with turtles. The shattered glass, canister and turtles all fell into an open manhole cover, dropping into the murky sewer below. The metal container held some strange chemical, and when it hit the floor of the sewer it broke, bathing the turtles in its glowing ooze. Splinter, curious, went to see what had become of the turtles. He collected them into a coffee can and cleaned the goo off of them as best he could. The next day the wise rat found that he and the turtles were mutating… becoming more human-like with each passing day! Eventually the turtles spoke, and Splinter began to set his own plan for vengeance into motion. 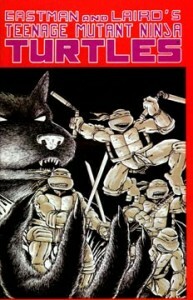 He began training the turtles in the art of ninjitsu that he had learned from Hamato Yoshi. He named each turtle after a famous Renaissance artist, whose names he had found in an old book forsaken in the sewer. Another forgery trick is to take legitimate copies of the second or third printings and bleach out the printing notation text to make them appear to be first printings. Second and third printings are labeled as such on the top left corner of the inside front cover directly beneath the “Special thanks to Quentin Eastman” text (there is no printing notation on first printings). Also of note: the inside back cover of first printings features an ad for the two “Gobbledygook” zines. The inside back cover of second and third printings features an ad for TMNT t-shirt iron-ons. Also of note is that the address for Mirage Studios changed from Dover, NH to Sharon, CT on the indicia of the third printings. To view large images that illustrate the differences in printings, click here. Please be careful when attempting to purchase a first printing of TMNT #1! Note: Printings 1-3 were oversized (7 3/8″ X 10 7/8″) and featured this cover. 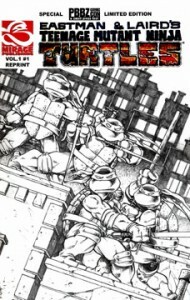 Additional Material: 9 page TMNT story by Eric Talbot. NOTE: This edition was limited to 3,000 copies and distributed via Ralph DiBernardo’s “PBBZ Comic Con Small Press Fest”. Peter scanned the original inked artwork and redid the toning (and lettering) with a computer. Ralph provided the forward explaining his involvement with Kevin and Peter back when they originally released the comic.